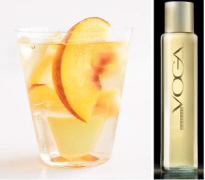 Pour VOGA Moscato and beer in a large pitcher and add sliced peach, apricot, apple, lemon and lime. Next add triple sec and stir gently. Chill mixture for at least one hour, and top with club soda and stir before serving. Enjoy your cocktail drink!